Swimming champion Michael Phelps and other top athletes drew crowds at the USA Swimming 2011 Charlotte UltraSwim Grand Prix meet, held May 12-15 in Charlotte, NC. The event, hosted by SwimMAC Carolina, has been a popular athletic event in Charlotte since its inception in 1985. 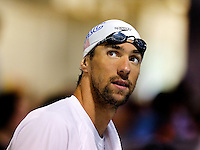 At the event, Phelps moved up to fifth in the world in the men's 200 back with the time of 1:57.20.